Katie Hindi was born Katie Mae Washington in Columbia South Carolina to Lizzie Hollis and Jimmy Lee Washington on April 9, 1956. In June of 1957 she moved to Newark, NJ where she was raised by her mom and stepfather the late Willie Walker. Katie is the third oldest of nine children, the late Isadore Hollis, the late Jimmy Lee Washington, Clint Walker, Claston Walker, Michael Walker, Gloria Kimble, Gladys Walker and Kieshawn Hollis. She the mother of three children, Shykeisha Washington, Kasima Bartee, and Qaseem Washington. She is also the the grandmother of 6 grandchildren, Rachiem Farrell, Satone Davis, the late Shyheim Washington, Sydney Bartee, Karim Bartee and Adien Washington. Katie attended Weequahic High School and also a business training school downtown Newark, NJ in the early 90’s. 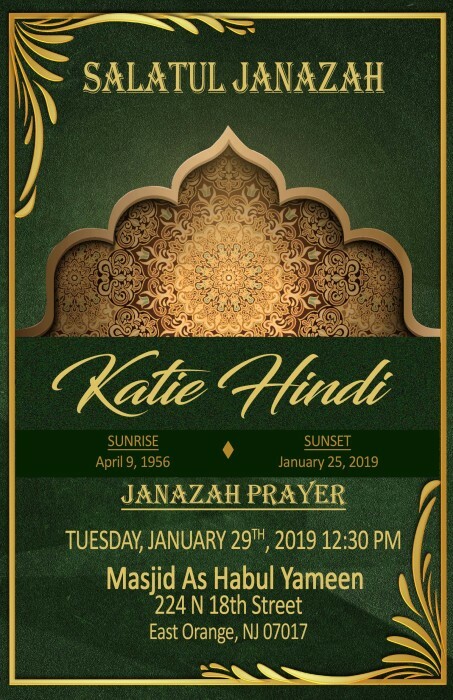 After a lot of changes in her life, Katie Hindi took her Shahada and married Kaied Younis Hindi. It was then that she changed her life for the better and never looked back at the past. She moved to Syracuse in 2014 and returned to New Jersey in 2017. Katie who went by Jamillah was a loving wife and grandmother. She loved her family dearly. Jamillah loved shopping, cleaning, cooking, going to the city, going out to eat and her latest favorite was Star and Empire. Jamillah will be dearly missed by all her family, friends and loved ones.